Two Days of Pain Management for the Main Street Practitioner on April 6-7; mingle with faculty and attendees, learn and earn up to 12.0 AMA PRA Category 1 credits for $199. This course will present and detail the variety of current regulatory forces that need to be considered in clinical practice; how they can potentially impact clinical decisions regarding chronic pain; and how they can be negotiated. 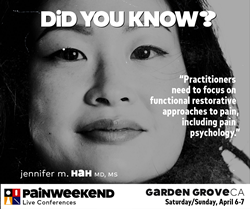 PAINWeekEnd on April 6 and 7 at the Hyatt Regency Orange County, 11999 Harbor Boulevard, Garden Grove, California, will be a timely 2-day program providing busy clinicians and allied healthcare practitioners with 12.0 hours of relevant, practical instruction in the management of chronic pain. In 2018, the California legislature passed 14 new laws intended to address the crisis of opioid abuse in the state. Among the bills signed by Governor Brown and scheduled to take effect in 2019 are new requirements for standardized and serialized prescription pads; enhancements to pain related CME requirements that mandate instruction in addiction risk; and direction that prescribers of opioid medications provide access to, and education in, the use of naloxone. Additional regulatory measures are scheduled to go into effect over the next 2 years. Senior PAINWeek faculty member Kevin Zacharoff, MD, FACPE, FACIP, FAAP, has lectured widely on the impact of expanding regulatory oversight on the practice of pain management, particularly with respect to the interests of the most important stakeholder: the patient. At PAINWeekEnd Garden Grove, Dr. Zacharoff will present his course The Regulatory Agency Will See You Now about which he commented, “This course will present and detail the variety of current regulatory forces that need to be considered in clinical practice; how they can potentially impact clinical decisions regarding chronic pain; and how they can be negotiated.” Dr. Zacharoff will also lead an examination of the role of illicit substances in the overdose epidemic in his course The Other Opioid Crisis: Heroin and Fentanyl. Other courses to be offered at PAINWeekEnd Garden Grove include Involuntary Tapers: Legal, Ethical, and Clinical Concerns; Embrace Changes and Prevent Overdose: A Basic Blueprint for Legal Risk Mitigation and Response; Cannabis vs Cannabinoids: The Politics of Medical Marijuana; Get Your Specimens in Order: Timely Use of Test Results; Policies and Practicalities: Focusing on the Patient, Not the Opioid; The Psychology Toolbox: Evidence Based Treatments for Pain Management; No Guts No Glory: Mystery of the Microbiome; Minimizing Pills and Maximizing Skills: Achieving Successful Opioid Cessation in Chronic Pain; Burnout! Recognize Symptoms, Enhance Resilience, and Improve Quality of Life; and Medical & Recreational Cannabis, What’s a Clinician to Do? Commercially supported activities—addressing a range of product, disease state, and medical information topics—will also be presented.